Elani is a gorgeous true black bred female. Her fleece is her standout characteristic, amazing density with beautiful bright fleece. Elani WON! First place 2017 National Alpaca Fleece show, spin-off! Her genetics are that of Champions and this girl will be able to put a champion on the ground for you. Elani has never been shown but her two maternal sisters have done well in the ring. Keela, a Beethoven’s Dorian daughter brought home reserve champion at the Carolina Alpaca Celebration. Aislinn took first in the PAOBA as well as 2nds and 4th at the VAOBA expo in fleece and halter, respectively. Giacomo was born on Silvercloud Farm with an extraordinary case of “soft rolling skin”! This is a rare occurrence in crias and is a precursor to extreme density of the fleece due to a high frequency of hair follicles per inch. That was certainly the case here. Giacomo’s fleece was the densest on Silvercloud’s farm and was truly the proverbial “Berber Carpet”, yet with a buttery-soft hand. His fleece opened “like a book”. Giacomo was the son of the late great Peruvian Dakotia, a son of the legendary Bueno, from Magical Farms who tragically passed away in the 2003 Land O’ Lakes feed poisoning incident. His Dam, MFI Her Majesty, was part of Silvercloud Farm’s foundation herd and is a granddaughter of another late, great alpaca CALIGULA. Bueno + Caligula, that is an amazing pedigree. At the 2014 VAOBA show, an alpaca gentleman asked if anyone remembered the Champion Herd sire, Ameripaca’s Solomon. Solomon is Elani’s grandsire on the dam’s side. Many years after Solomon’s passing, people are still talking about this phenomenal black herd sire. These genetics are gone forever except in this great production female who just won a blue ribbon at the National Alpaca Fleece show, Spin-off. Be part of carrying these genetics forward. In early August 2016 she delivered a stillborn baby girl. True black and perfect in every way. We’re confident that Elani is carrying forward the genetic powerhouse in her pedigree. Elani has been bred to our outstanding white male, Light Sabre’s Leonardo, for an early 2018 cria.. 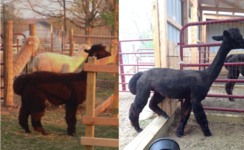 In addition, you will have the right to purchase one unrestricted, transferable breeding to any of our males for $250.